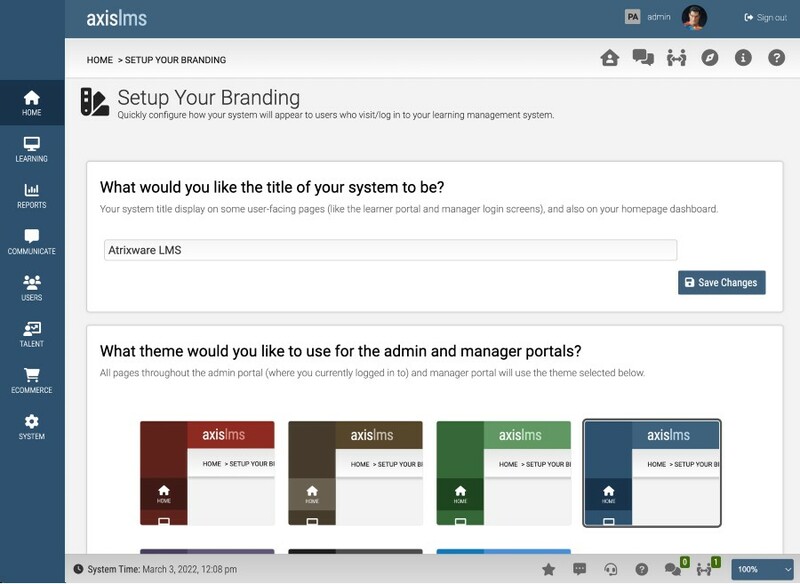 Don't settle for simple branding options when Axis LMS gives you unmatched control. Just about everything a user sees, from public-facing to private content pages are fully brand-able complete with who (can see it), what (they see), when (they are eligible to see it), where (it gets shown) and how (it shows). Colors, sizes, positions, and much more are configurable by you. Whether it's to match your existing website, or to create a specific user experience, Axis LMS gives you the tools you need to create the look and feel you want. When we say that every aspect of the User Interface (UI) is configurable, we mean it. From the topmost level of your Account Website, drilling all the way down to the different responses for passing and failing any given quiz, you are able to tailor a unique visual and learning experience for your users. Take full control of your Axis LMS Website. Dictate everything from navigation, page layout and content, down to the metadata. Axis LMS enables you to do it your way. Customize the UI and logic of your online activities. From the activity layout and theme, to the certificates, to item feedback, you have quite a bit of control. Drag & drop makes creating your courses easy. Whether you are a beginner, or an advanced content builder, Axis LMS contains tools that are right for you. Start with the easy-to-use course builder, featuring drag & drop functionality — simply drag one or more documents, PowerPoints, videos, images and more onto the drop target, and Axis LMS turns them into learning activities inside your course. Do you already use an authoring tool such as Captivate, Articulate, PowerPoint, or other tools to create your courses? You can easily bring in SCORM courses, PowerPoints, Videos, HTML5 and more. Or, use the built-in tools to create interactive presentations, quizzes, surveys and more. Set up course content and activities that ‘unlock’ once previous content is completed. You can group multiple activities and blocks of content together, or set them up individually. Assign time requirements to each activity. Some activities may need to have a minimum requirement of time before considered complete, and others may have a time limit (quizzes). Set up content that is hidden until certain criteria is met by the user, like completing certain activities, being a member of a company or group, the date or time, or just about anything else. Robust Reporting features increase productivity and ensure compliance. Axis LMS contains a verbose reporting engine, spanning from on-demand reports to scheduled reports that can be saved and emailed. Complete filtering on multiple data points is available. Set up report filters that you can save and use in the future, and across any course. Apply the filters to other courses with just a few clicks. Save filtered reports and assign them to report administrators that can sign in to the reporting portal and view just the reports you have assigned to them. Set up reports that save or email nightly. Configure the reports based on data points, filtering, and even set up the data fields that get stored in the report. Communication with your users is essential, and Axis LMS gives you numerous ways to do so, spanning automated, real-time, and collaborative mechanisms. Email individual users or groups of users. You can even configure scheduled emails to go out for invitations, reminders, announcements, and more. Use the social platform built into Axis LMS to share posts, set up collaborative groups, encourage participation via the gamification badges, and more. All users get an internal messaging account for easy communication with others in their courses and/or usergroups or their manager. Built-in forums enable discussions across courses or usergroups. Live chat messaging is built-in, for real-time one-on-one communication with your users. If you are running a continuing ed program and need to track CEU credits and re-certifications, Axis LMS has you covered. Set up certification programs, including an initial certification course, how long the certification lasts, courses eligible for recertification, and CEU credits needed to re-certify. Already have data for users' certifications or CEU credits? Import that data and assign it to Axis LMS certification programs you create, thereby automating them from that point forward. Set up email reminders that go out to users as their recertification window is expiring, thereby automating the process of keeping your employees (or customers) certified. 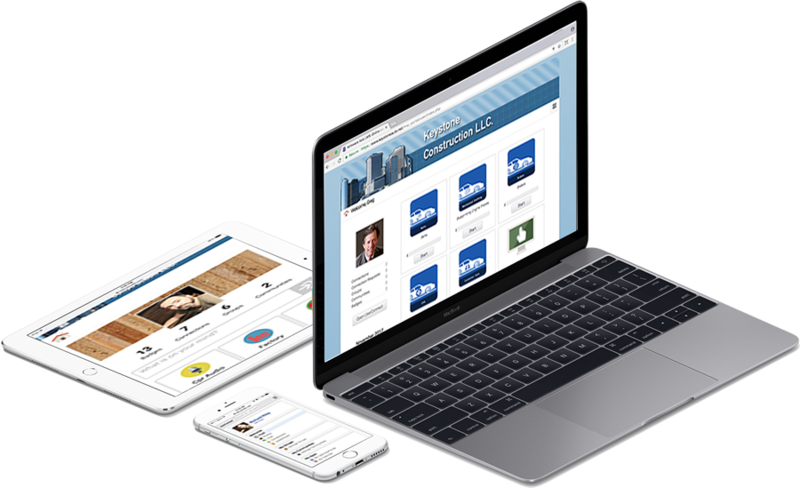 The exclusive Adaptive Web Engine in Axis LMS means you can create fully customized web sites and online courses that work on both desktop and mobile devices. Do you need to limit the content on mobile devices? Do you want to prohibit content from being delivered on mobile? Do you want the mobile content to be totally different than the desktop? All of these and more are possible. While our competitors tout ‘mobile’, what they don’t tell you is there is very limited configurability (basically you get what you get). Compare that to the Axis LMS Website designer and Course designer, both which give you configurability way beyond what you have seen elsewhere, while still giving you the benefit of mobile and desktop rendering. One very powerful way to increase trainee engagement is through networking. Axis LMS features an exclusive feature called UserConnect — a built-in, private social network for your learners. UserConnect offers learners a way to connect inside the LMS with others in their department, skillset, or other similar match-up. They can celebrate learning achievements, interact with instructors, and more. Set up unlimited badges that can be achieved by completing tasks such as passing courses, participating in online activities, posting in forums or UserConnect, earning a certification and more. Similar to Facebook or Twitter, users can post to their own wall, or on threads for groups they are members of. Users can create their own communities to learn with — using both the UserConnect functionality, and also the build-in Forums that can be associated with courses or usergroups. Sell your courses with the integrated E-Commerce Store. Its easy to sell your online courses as well as offline products such as classroom registrations and even physical products. The Axis LMS shopping cart works with the worlds two most popular e-commerce gateways. Setting either one up is a snap. Just pick your gateway, fill in some information about your account, and you are all set! You can use the pre-build storefront, or, use the website widgets to create your own custom storefronts (you can create 2 storefronts, one public-facing, and another private which can only be viewed by users that are signed-in). Its also easy to create links you can place into emails or your existing website. Some Axis LMS plans offer the ability to sell B2B via keycodes. An ‘agent’ for an organization can purchase blocks of course enrollment codes to hand out to their employees, and then use the LMS to track their employees progress and run reports. We have designed Axis LMS to integrate with (and talk to) just about every system and application you use, including CRM systems, Mail Apps and services, HR systems, and many more! We have tools for techies, and non-techies to enable to you integrate Axis LMS with other systems your organization uses. You can also integrate other systems with Axis LMS, making it seamless for your organizational processes. Axis LMS works with Zapier - a service that enables you to easily connect to 1,000+ systems and apps. If you are not 'technical', Zapier makes it quick and easy to create connections between Axis LMS and your HR, CRM, Email or other service or app. Do you have images, videos, documents, live training, or training modules hosted somewhere on the internet? It is quick and easy to use that content in Axis LMS. Axis LMS has an API with dozens of commands, including an easy-to-use API Builder application, complete API logging, and an API Key management console. It's easy to get started. Schedule a consultation, or call us at 1.866.696.8709 and tell us about your goals and challenges.